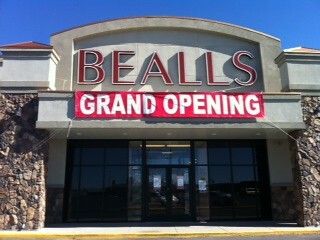 Photo by Megan Smith: Bealls grand opening celebration. Bealls celebrated it Grand Opening in Alamosa Wednesday, April 18. The new store is located at 157 Craft Drive near highway 160 between Ace Hardware and Aaron’s. A free tote bag was offered to their first 150 customers. Robert M. Beall created Bealls in 1915 in Bradenton, Florida as a dry goods store called Dollar Limit. Passed down through three generations aspirations for the store changed to become Beall’s. The vision was to expand the company to serve middle income retired families that were migrating to Bradenton, FL. where a second store was open in 1956. Then later came third store in Venice, FL. in 1961. Finally 1987 the idea for the company was to become apart of the outlet store boom craze. Currently Bealls has over 535 stores in the U.S. including one here in Alamosa. Bealls sells a wide variety of Men’s, Women’s, Junior, and Children’s shoes and apparel. They also carry a unique selection of brand name jewelry, fragrance, handbags and home accessories. “This store will allow more options when shopping for clothes”, said Melody the Bealls store supervisor. The large, open layout allows a family friendly environment for customers to move quickly and efficiently throughout the store. Customers also have the option of opening a Bealls credit card giving them exclusive discounts and saving offers. “Every customer should be greeted when entering the store and no customer should be left unassisted”, said Robert Parcels store manager as he directed his morning staff.